I had to make a few tweaks to the deck in my testing. 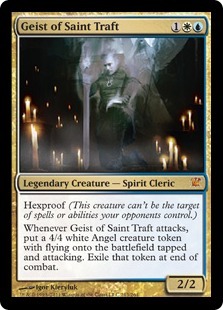 I am missing a Geist of Saint Traft so I substituted the final copy with a Loxodon Smiter which I have been happy with it. I also don't have the Horizon Canopy either so substituted that with another copy of Temple Garden, though I fancy trying. The combo is pretty simple in premise. The concept is to have an active Knight of the Reliquary in play and a Retreat to Coralhelm. 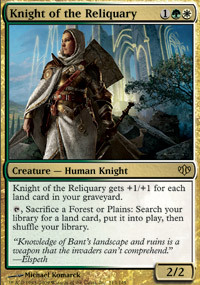 You can then sacrifice a Forest or a Plains with the Knight's ability and put another land into play, which then triggers the landfall ability of Retreat allowing you to untap the Knight and start the process all over again. As a result you can make a pretty huge Knight that can then hopefully attack for lethal damage. The finer points of the execution of the combo are a little more complex and I don't think I've quite mastered it in my time playing the deck so far. While writing this article though I found the video below by LanternMTG which teaches you the best way to combo and has taught me some of the nuances. The video is quite long but worth checking out to help you learn the best route to combo. 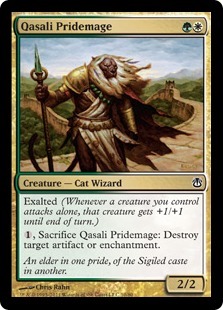 This primer is written on the basis that the deck runs Sejiri Steppe, which is notably absent from Caio Amaral's deck but the general premise is the same. Search up a fetchland with Knight first. Retreat to Coralhelm triggers and you choose to untap the Knight. It can be a good idea to search up another fetchland by a sacrificing another land as this means you can crack the first fetchland to get another landfall trigger and untap your Knight (which works well if you are playing Sejiri Steppe and search this up to protect your Knight). You then crack your fetch for a land - all of the fetchable lands in the deck are either Forests or Plains so all can be sacrificed to Knight. When the fetched land comes into play you get another trigger of Retreat that you don't need to use to untap Knight. So you can use these triggers of Retreat to tap down opposing blockers, untap a Noble Hierarch or Birds of Paradise to generate mana or Scry if you wish. If you tutor up a Ravnica Dual you can choose to pay 2 life to put it into play untapped. 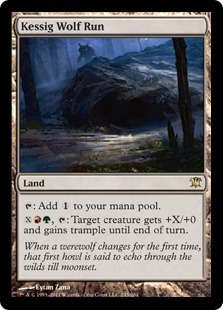 If you are looking to use Kessig Wolf Run you may to fetch a Stomping Ground to get the red mana needed to activate it (if you do not have a red source already). The basic lands in the deck obviously come into play untapped and will give you some extra mana. Once you have got Knight sufficiently large with this process you can tutor up the Kessig Wolf Run and pump any mana you've generated into that and attack for the win (hopefully!). Be aware that this process works best in the early game. As the game goes on you are likely to draw more of your fetchable lands and each time you do you reduce the number of lands you can get into the graveyard for Knight as your fetchlands will run out of things to fetch. 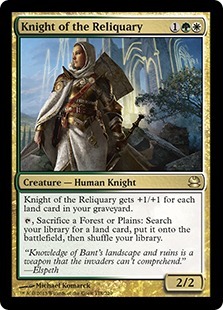 You will still be able to make Knight of the Reliquary pretty huge though if you put together the combo later in the game, also hopefully your opponent's life total will be significantly reduced by that point anyway. These are your mana dorks. They help you bust out the combo as early as Turn 3 and in general help you hit your three drops a lot faster. Hierarch also provides extra combat support with its Exalted ability. 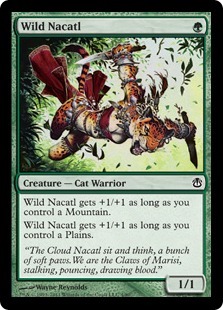 Nacatl is a fast and aggressive one-drop, so good in fact that it was banned in Modern for some time. Thanks to the red splash in the deck you can make Nacatl into a 3/3 pretty rapidly and get aggressive quickly. I have to say I have queried the number of Pridemages in the deck. That's not to say it isn't a good creature. It can attack for 3 on its own and also can be a Disenchant if so required, which can be very useful against decks like Splinter Twin or decks that will try and lock you down with a Blood Moon. Voice of Resurgence could be another option here and testing would probably reveal which is the better choice (unfortunately I don't own any copies of Voice to verify). Not a great deal of explanation needed here. Tarmogoyf is a Zoo staple as a generally oversized 2-drop that can seriously pressure your opponent's life total. The only real problem with Goyf in the deck is that this deck isn't huge on throwing cards into the card. We have plenty of fetchlands and we've got instants but there are no sorceries in the deck and not many ways to put more cards into the graveyard. Generally this isn't a huge problem as your opponent will usually assist you in this regard and of course killing their creatures etc. 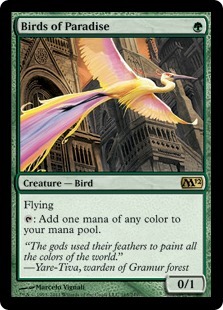 can help grow the Goyf. Geist is an extremely powerful three-drop that has fallen considerably out of favour in Modern. This deck revives interest in the Legendary Spirit and it is certainly very good here. Powering out a Turn 2 Geist off a Hierarch or BOP can just steal games as the damage racks up quickly, particularly against decks that can't protect well against it. 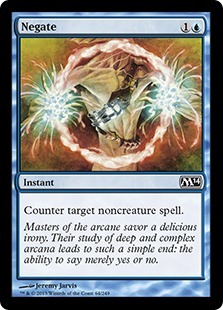 The best removal spell available in Bant colours. Path is a great answer to the majority of the threats in the Modern format. 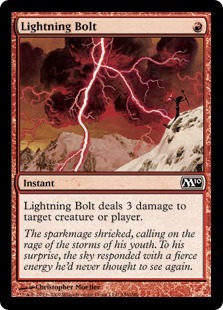 A red splash in the deck helps pump your Wild Nacatls and also gives access to the most popular removal spell in the format, Lightning Bolt. Bolt is obviously a great addition to the decks aggressive Zoo-style central strategy, allowing you to hit your opponent's dome or clear the way for your attackers. The original Elspeth has seen occasional play in Modern but never quite made it as a staple. She's clearly very powerful and is a good play for a game that is likely to go long as she gives you a long-term advantage that is difficult to keep up with. She also can help you punch through damage with her second ability allowing you to jump a Tarmogoyf or a Wild Nacatl to hit the opponent hard. Elspeth kind of surprised me as an option as I would have expected to see a card like Collected Company in this slot, which has become a bit of a staple in Zoo decks. Wolf Run is the tutor target of choice for finishing off our combo. It is possible to generate some amount of mana as we are carrying out the combo and this can invested into a Wolf Run activation to power up Knight and allow it to trample over any opposing creatures. 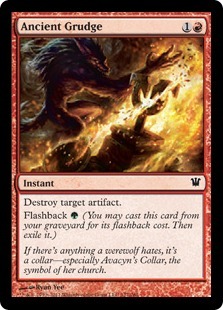 Ancient Grudge is very powerful artifact hate. Great against Affinity and Tron decks. Fracturing Gust is a card I haven't got any copies of so I haven't tested it. With the ramp in the deck it could be fairly easy to cast this quite easily. Pretty awesome against Affinity and Bogles but worth all those slots? Not sure. 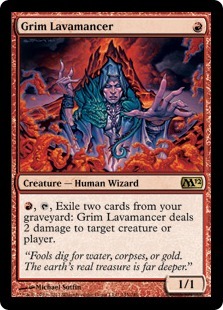 Grim Lavamancer is an interesting one as this deck isn't heavily centered in red. 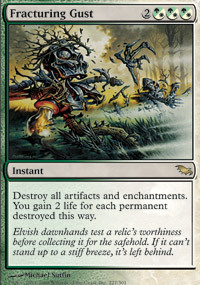 It's a good option against decks that run smaller creatures and adds to the removal capabilities of the deck. A useful resource. 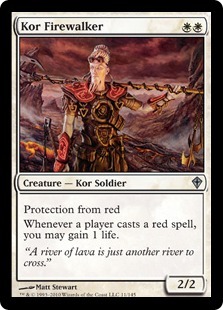 Kor Firewalker is obviously an anti-Burn/RDW card. It's extremely good against those types of decks but be wary that most of these decks will be prepared to face such a threat and will have answers available. Negate and Unified Will are your counterspells. It has to be said that the main deck doesn't do a ton to harness the power of Blue. 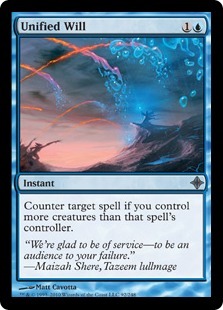 Countermagic is one of the best things Blue can offer out of the sideboard and both of these cards are great answers to combo decks and decks look to drop expensive haymakers. 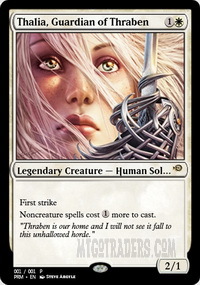 Thalia, Guardian of Thraben is one of my favourite cards in the board. As the base of the deck is a Zoo list we can work around Thalia well and she can do a lot to slow combo, control and other spell heavy decks. Our first matchup is against Naya Burn. Burn is a powerful and speedy deck that can be difficult to handle. We are definitely not the beatdown in this matchup but have larger creatures that can help defend us. The combo can also work but it requires life to be operable, so unless you can get it online quickly you probably won't have enough life to kill the opponent. Our second matchup is against Gruul Zoo. This deck seems to be seeing a bit of a revival. 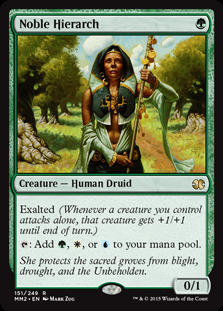 The addition of Atarka's Command certainly adds a lot to this style of the deck. I have been testing a similar list and might write an article about it. Another very aggressive deck that can be difficult to combat. The lack of mass removal or life gain in the list makes this a difficult matchup, though Kor Firewalker can help defend, as can our large creatures. If we can drag things into the later game I certainly think we have an advantage. Our third matchup is against Nykthos Wave. Wave isn't a particularly popular deck but it did give me a chance to show off the combo in Game 1 (though not as expertly as LanternMTG). Grim Lavamancer is very good out of the board to kill off their Elves and keep their Devotion count down but generally our quick beatdown can be very effective. Our fourth matchup is against Jund. This matchup is tough and I don't think I got the hands that were good enough to combat the disruptive abilities of Jund. 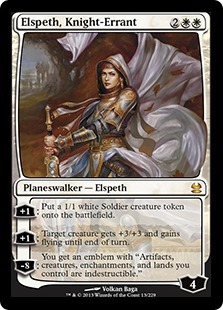 One thing I will note is that Elspeth, Knight-Errant really shone here, allowing us to build our board and if we had managed to activate her ultimate I think it would have been very difficult for us to lose. I have to say this deck hasn't really proved to be my cup of tea (though actually cups of tea aren't really my cup of tea so perhaps that's a poor analogy). The combo is quite interesting once you learn the intricacies of it. The combo has its strengths and weaknesses but my real problem is with the Bant Zoo shell in which it operates. Bant Zoo hasn't been a major player in Modern since the days of Counter-Cat Zoo at the first Modern PT, which led to the banning of Wild Nacatl and Green Sun's Zenith. Honestly I think there's a reason for that and it's that Bant just isn't that good. Bant as a colour combination feels quite confused - it's not quite aggressive enough to be a strong aggro deck and it doesn't quite work as a Control deck either. Removal is also an issue for Bant beyond Path to Exile - which is why this deck splashes Red to get Lightning Bolt. Other people are quite high on the deck and certainly taking 3rd place in a GP does add credibility to the archetype. However, it's not a deck that I feel is quite there for me.